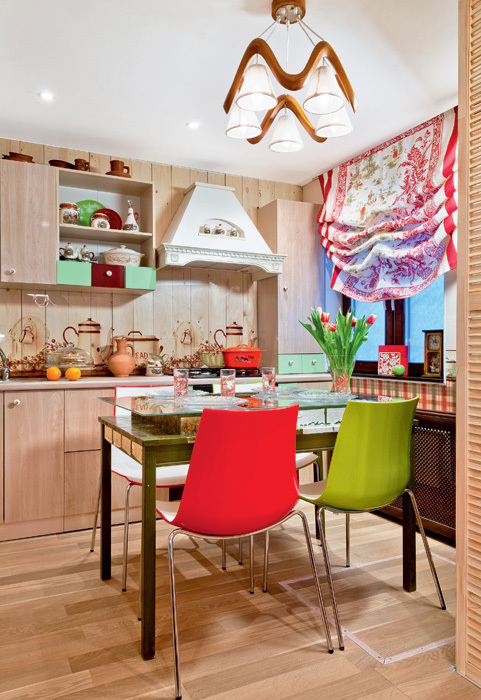 The owners of this kitchen in a summer cottage are keen fans of folklore, old traditions and especially folk songs. The latter can be heard in their house almost every day. The only thing that didn’t answer the needs and mood of this cheerful family was the room, where they cook and eat their food. That is how these people became participants of a TV show, in which families can get interior designs of their dreams absolutely for free. Let’s have a look at what they got! When the author of the project asked the hosts about the way their dream kitchen should look like, they said they had only two requirements: the kitchen had to be simple and rural and made from eco-friendly finishing materials. That is why it was determined to base this interior on wood. For a start the walls were finished with pine boards that were processed with a smoothing plane, which made them smooth like silk, and additionally coated with a layer of lacquer. The door was decorated with American walnut veneer, and kitchen cabinets and worktop were also made in light wood. Thanks to this trick the kitchen suite doesn’t stand out against the background of the walls and the pretty tight room looks more spacious and airy. Especially for the kitchen backsplash handmade were 6-mm-thick tempered glass panels with a digitally printed image. Such a solution enabled the designer to place the cooker close to the wooden wall. And a radiator was concealed behind a decorative perforated cover of wenge color. Glazed handmade ceramic tiles are traditionally used for facing the stoves, but here these gorgeous pieces adorn the doorway between the kitchen and dining room. 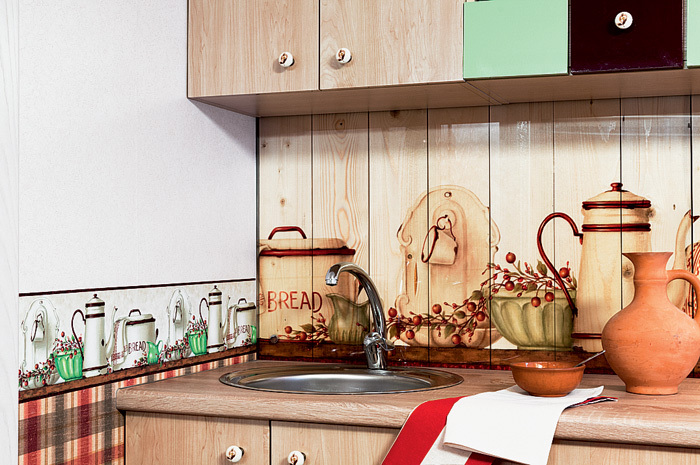 Red-and-green checkwork was digitally printed on a piece of paper and used for decorating the bottom part of the kitchen wall. 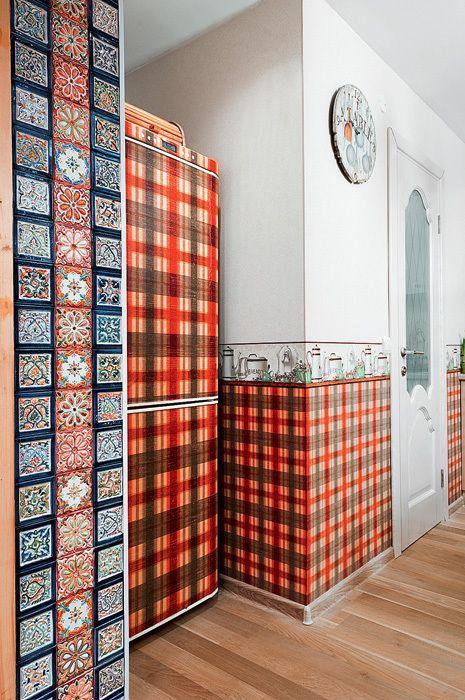 The same tartan was printed on a self-adhesive film and can be now found on the refrigerator. The top parts of the walls were finished with neutral wallpaper. And the role of a decorative border between them is played by a cellulose strip featuring coffee pots, cups and other kitchenware, which visually connects this part of the room with the preparation area (the backsplash print). The floor is finished with HPL laminate with a special undercoat that absorbs noise. This was especially relevant for this family with three little kids. But the piece of this interior that deserves a special mention is an original designer dining table. For a start the decorator removed the old lacquer with the help of abrasive paper. After that he sawed out a new cellular framework for the table top from veneer, painted the entire construction green and added a touch of golden plates on the sides to bring some elegancy to the composition. Finally, versatile nuts and dried beans filled all the cells, and the table was covered with a piece of thick glass.